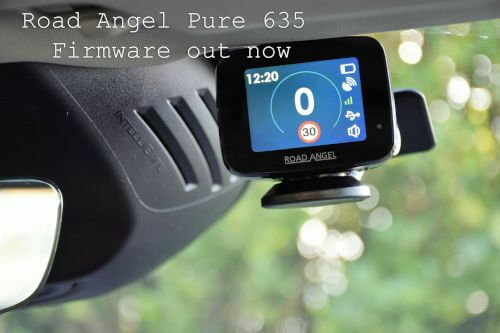 Road Angel announces firmware release 635 which delivers a wealth of additional features and revisions for improved user satisfaction. Alongside the new road speed library and a fix for British summertime / daylight saving clock settings, the hardwire mode is also temporarily disabled if the Pure is switched on without power. There's also a selection of bug fixes around voice and speed limit alerts and the update notification message now has to be dismissed by the user. Topping it all off, the fixed camera and camera van alert sounds can now be set independently for further user customisation via the Smartphone app. Update 635 is available now. An issue has been highlighted with Road Angel's latest firmware, affecting the voice and alarm sounds working independently from a sound volume perspective (this was a key customer requirement). As we are working on a new firmware release at the moment, we will fix this alongside the improvements we are making to ensure a complete update resolving the above issues – key change improving the frequency of updates it is receiving from the server for smart motorways – from 2 minutes to 1 minute. Thank you for your patience and support, and please check in with us again for further updates later. The latest round of Road Angel firmware and PC/Mac software updates have just landed, they promise improved functionality across the board and a much easier end-user experience. The latest Firmware and software updates fall in line with the addition of the Smart Motorways feature recently added to the Road Angel Pure, but the same easy setup and simple configuration now compliments even more comprehensive live data streams to ensure your license stays safe. Please make sure you’ve updated the latest version in order to enjoy all of the new features that we’ve built in. As of February 4th 2019, the latest PC/Mac Updater and the Road Angel Smartphone application have both undergone a few changes for improved functionality in response to the recent Road Angel survey. This will bring a number of benefits to customers and make the Pure even more user friendly as a result. A number of changes, bug fixes and improvements have been made along the way. It is important that you update to the latest version of all three elements. Recent changes to the firmware update, includes a 3-month free trail of the integration with UK Smart Motorways. This makes the Pure the only device of its kind with this technology and is directly linked to the DoT database for variable speed change updates within 2 minutes of them actually taking effect with the Department Of Transport. Then there’s a 70mph dual carriageway update, revised stolen message, new boot up screen and a January 2019 Road Speed Library update. In short, the revisions make the Road Angel Pure even more robust in preventing a speeding ticket due to a momentary lapse of concentration. Users will also benefit from a revised power down screen, searching for satellites screen and a fix for the 5mph speed limit that was picked up on trails where automotive access isn’t allowed. We can’t shout loudly enough about the Smart Motorways update, and firmware update 623 brings that often misunderstood section of variable road network under close scrutiny, all to ensure no points for even the most seasoned motorway user. In line with these firmware updates, the PC / Mac and Smartphone updater has also been improved for a smoother user experience (Road Angel Updater 557). This again falls in line with the Smart Motorways feature, and you can now reset the settings back to default, change voice volume and system volume as separate entities and check for the latest firmware updates as well. A host of bug fixes and UI improvements also make themselves known, but few will probably notice the difference as overall interaction with the unit remains handsfree and trouble free until you actually require it to slow you down slightly. Our R&D team has also completed extensive testing of our GPS sensor technology through a variety of heated front windscreens. We’re delighted to report that the device is fully compatible with all heated front screen models tested. For vehicles fitted with solar control windscreens however, as with all sat-nav and mobile devices, the Pure will not work correctly. Please bear this in mind if you have a vehicle thus equipped. All in all, February is looking like a very positive month for the Road Angel Pure user, and we’re glad to continually evolve and improve and product that’s always going from strength to strength. Road Angel would thank all those who took the time to take part in our December 2018 survey, thank you. We at Road Angel strive to deliver sublime products that are ground-breaking and market-leading, for us to do this we always have our customer in pride of place and are constantly sending out surveys and using focus groups. From our recent survey, most of you asked for a “Sucker Mount option” we sat with our research and development department and we are pleased to announce that we will now develop a sucker mount that can be retrofitted to Pure Windscreen mount. Our UK design team have started work on the sucker mount adaptor and we hope to have it in stock this summer. Our survey is still open so if you have any positive or negative feedback for us please feel free to participate in the Survey. You may be aware we recently included the feature in our App to be able to update the firmware and RSL on your PURE. We trialled this feature with our Beta testers and then later released to the wider PURE user population. However, many of you took the time to provide us with feed back of your experiences of this process. After we had analysed and digested all the data received from this feedback, we have taken the decision to remove this feature from the app. You will still be able to update the firmware and RSL via the updater for your PC / MAC. Accidents can happen at any time. When you think you had full view of the road, there are still times when we can miss what really happened in an accident. You have faith that your dash cam has recorded that information. If your dash cam SD Card fails you could lose important incident footage that may be crucial. This is why the Halo Pro incorporates D2 Save Technology. Utilising a dual storage configuration, with both internal NAND Flash and an external SD Card. The Halo Pro uses its internal NAND Flash storage to keep vital event and incident recordings safe in case of SD Card failures. A pilot project in Gloucestershire called ‘Operation Indemnis’ set up to tackle speeding and other motoring offences has been launched amid claims the giant police camera can spot offences up to a mile away. These of course include speeding but also take into account the annoying and hugely dangerous tailgating and thanks to an incredibly powerful lens, it can even spot people using their phone without hands-free. It’s not just photographs either, this incredibly sophisticated technology can even film motorists in the act at the twice the distance of normal speed cameras. Police will use the camera and automatic number plate recognition (ANPR) to check on what vehicles are on the roads and how they are being driven. The main aim is educational people about safer driving, so some drivers will be given advice about their driving while others, who have committed offences, will be prosecuted. ‘We now have a chance to test a new model of collaborative road policing which, if it proves a success, can be put into practice elsewhere. At Road Angel, we welcome anything that helps make our roads a safer place and our motorists better, safer and more aware of the hazards around them and those that they may cause. Remember, speed limits are there for a reason as are signs about changing road conditions and the need to switch lanes. Also, please do NOT use your mobile phone behind the wheel, it is hugely dangerous, not to mention illegal. There are so many options for you to go hands free, take a look at the selection from our friends at Car Audio Centre for ideas for Christmas gifts or if you are concerned about the ever-changing speed limits, you can buy our fantastic Road Angel Pure right here. New government figures have shown that drivers simply can't get to grips with 20mph speed zones. The Department of Transport's annual statistics on compliance with speed limits show that some 86% of drivers break 20mph zones, and more in the early hours when that figure can rise to a shocking 94%. The Department for Transport (DFT) studied over 1,000 cars to come up with their new stats, which show that, last year, while just nine per cent of car drivers break 60mph limits, those travelling in 20mph zones are nearly 10 times more likely to break the law, with average cars speeds tracked at 26mph in the zones. Don't just blame it on car drivers, though. The figures show that 77% per cent of larger bus drivers and 53% of smaller bus drivers also broke the 20mph limits last year. Meanwhile, some 75% of HGVs, 84% of LCVs (light commercial vehicles, or vans) and 85% of motorcyclists; the latter being the worst offenders with an average speed of 27mph in 20mph zones. Interestingly, the figures show that motorists are keener on 30mph limits, but slightly more than half of car drivers and motorcyclists still sped in these zones. The DFT's survey was far more widespread when it came to motorways where it monitored over half a million vehicles. Nearly half (48%) of car drivers were observed to be speeding, with 12% exceeding limits by 10mph or more. Meanwhile, 56% of motorcyclists sped on the motorway, though a higher proportion – 20 per cent – did so by more than 10mph. And just one per cent of HGVs – which, lest we forget, have speed limiters – sped on motorways last year. These figures have remained static for around seven years now, but that doesn't mean they're not too high. Speed awareness is a moral obligation when driving on the road - whatever the limit, but we understand that signage is not always as clear as it could be. Here at Road Angel, our products can give you the heads up on exactly what the speed limit so that you steer clear of points on your license, and, more importantly keep the roads safe. Hi Guys, We’ve been listening back to some of the feedback we’ve had over the past few months and we think its worth letting you guys know more about some of the terminology you may have heard us use when we’ve been in contact with you. This is the alerts database and is maintained by our team of Road Surveyors and our Database Administration team. This database can be updated in real time, sometimes daily. This information is transmitted over the air via the SIM card in the Pure using the EE mobile network. With our new features under development and currently being beta tested, we will also send the data around ‘Smart Motorways’ using the SIM card in real time. We contract this with HERE Maps. We provide approximately quarterly updates and this file is over 400 Mb and is currently updated via the PC and Mac updater, but we have also recently launched an update to the IOS and shortly the android app, allowing the RSL to be updated via your mobile phone – when an update is required there will be a ‘usb’ icon showing on the device and a warning message on power up. The Pure device has regular firmware updates which control the behaviour of the Pure and allows us to introduce new functionality and resolve bugs. Recently we have added management of the battery at extreme temperatures, we have changed the polling on the GPS receiver to provide a smother response and added new screen options. Currently we are beta testing ‘Smart Motorways’ and after this, we will introduce ‘snap to road’ to reduce the false alerts when cameras are on parallel roads, but within the distance set in the device. When an update is required to the firmware, there will be a ‘usb’ icon showing on the device and a warning message on power up. Since launch we have been making constant improvements to the Pure Firmware mainly centred around the management of GPS. In firmware version .612 we modified the software to allow 0.5 second polling of the GPS antenna and to support the new GPS module being used in the Mk2. This means the GPS array reaches out to the satellites every half second, rather than once a second, This has the benefit of the speed changing visually on the PURE far smoother for both the Mk 1 and Mk2. Customers may have noticed a small delay on the first use of between 5 and 10 seconds to acquire a satellite lock, but unless the Pure loses all charge, then this delay will not be seen again. When the Pure is not used for more than 6 hours, the ephemeris satellite data is no longer valid. GPS satellites transmit information about their location (current and predicted), timing and "health" via what is known as ephemeris data. This data is used by the GPS receivers to estimate location relative to the satellites and thus position on earth. Under these conditions the Pure needs to have a clear view of the sky and the GPS antenna has to go through warm start process to acquire satellites. This can take between 30 seconds with clear skies and a couple minutes with cloudy skies. In the event that a Pure is fully discharged, again the Pure will take up to 2 minutes to acquire a satellite lock as all the ephemeris satellite data is lost and the Pure will need to establish which GPS receiver it is using. The recent hot weather reminds us summer is creeping up on us. So now is a great time to think about the dangers of leaving any of your electronic devices unprotected in a hot car. We’ve all heard advice about not leaving children and animals in hot vehicles. But laptops, smartphones, sat Navs, dash cams and other devices are in plenty of danger too. The reason is that all electronic devices have safe operating temperature ranges. These tend to be around 40C to 85C, this is dependent upon the battery technology used. Many will automatically switch off when they get too hot. But the problems don’t end there. Even when they’re switched off, the safe storage temperature of most electronic devices is in the range of 0C to 85C. It's easy to see that the inside of a car can get much hotter than 75C in just a few minutes. At best, the rechargeable battery inside your device may experience shorter run times after exposure to high temperatures. At worst, they can stop working completely; In any event they are not able to be charged at temperature above 45C. Sat Navs and dash cams are built to be more heat-resistant, as they are often hardwired only or with super capacitors as opposed to Li-Ion Batteries. But their smooth operation can be affected by high temperatures – highly inconvenient if you’re just about to set off on a journey. Best advice is always to keep sat Navs and dash cams out of direct sunlight and store them in the glove box or under the seat when they’re not in use. This should preferably be in a padded case and turned off – not just sleeping. For any electronic device you might be worried about, always check the manufacturer's website or your user manual to get accurate safe operating or storage temperature ranges. The Road Angel Pure is designed to stop charging at 45C and run at temperatures up to 65C – with the clever magnetic charging dock they can easily be removed for safe storage without the hassle of having to unplug any cables, making it far easier to store during hot weather. We are delighted to be able to report that the new Road Angel Pure has been given top marks by industry bible Auto Express. The all new Pure created such a hype and buzz, We were asked by them to send our latest model down to their HQ for a thorough road test as part of their 'Speed camera locators: 2018 group test' as they sought to find the best devices and apps at identifying all types of speed traps on Uk Roads. So there you have it. A fantastic review showing that when it comes to quality and performance, the Road Angel Pure is the best on the market. Motorists are in for an early Christmas present this year, with the launch of the new 'Pure' from the iconic GPS technology giant Road Angel. The Road Angel Pure is the first new speed detection product from the group in over 5 years and has been developed following major investment by new owners, who acquired the business earlier this year. Their most advanced piece of kit to date, the Pure is packed with a wealth of new features, including high resolution graphics, dynamic sound and touch sensitive buttons. It can be instantly updated at the touch of a button with built in WiFi and features wireless charging via the Smart Mount. The Road Angel Pure also has built-in cooling, alongside journey tracking and road alert technology, all for increased peace of mind. Other new features include scratch resistant, anti-glare, ‘Gorilla Glass’, a 2.4'' clear sunlight readable TFT screen, auto-dimming based on ambient light, ‘intelligent mute’ and other personalisation options and smartphone configuration. "Road Angel is an iconic brand and has been a fixture in many motorists’ vehicles for over a decade. What motorists will now see with the new Pure is the fruits of major investment into R and D by the group. We’ve taken all of the best bits of our ever-popular Gem range and then very simply, we’ve listened to what motorists want." "What came over loud and clear was a need to be able to set the Road Angel Pure up as the individual wanted to best suit them. So, we’ve done that. We have a huge range of options for people to play with to get the unit working just right for them. We’ve also invested significantly in our team of Road Angels who are out on Britain’s roads logging new limits and restrictions and feeding that back to our team instantly." "Speed cameras are there for your safety but with ever-changing speed limits, it can be easy to make a mistake. The best drivers see the road ahead and drive to suit the conditions. Our advanced speed camera detector keeps motorists up to date and much safer on the roads. This is our most advanced piece of kit ever and one we look forward to sharing with our loyal customers and hopefully, many new ones too."